Most organizations implementing SharePoint fail to get the most out of the search and governance capabilities of the application. Why? Because they don’t configure the application with an information architecture that maximizes these powerful features. Here are some recommendations about how your organization can design a comprehensive information architecture design. When I work with organizations to implement SharePoint, most express a desire to leverage SharePoint to make it easy for people to find information and to have better control of what happens to information over time. SharePoint has a powerful search engine and flexible controls to automate governance and retention of content. In order to get the most out of these tools, you need to configure your SharePoint application to understand what your content means to your organization. You start this identification process by identifying how you organize your data, and understanding how you organize data for search versus supporting work processes. This is organizing and identifying content as it relates to the products and services the organization provides. Examples would be: by customer, by product type, by service. Organizational identification relates the content to the reason you’re in business. This is organizing and identifying content based on how it is used by your organization to provide products and services. Examples would be: a form, a policy, a contract, an invoice, or a Help Desk ticket. Functional identification many times indicates relationships to a business process. Every organization has its own unique combination of structural, organizational and functional identifiers. In some cases, only one method is utilized. In others, all three. Variations exist between departments. When you create your information architecture in SharePoint, look at how you organize your data and identify how you use the three methods of identification. This forms the framework for what pieces of information need to be associated with your content to facilitate search and governance. This happens when organizations confuse the needs of search and process management. An organization reviews their existing file shares and see some departments have layers and layers of sub folders. Here’s an example: Accounting does month end close. They create a folder under the Accounting Drive for 2017’s closing documents, and then they create subfolders for each month. Then they create sub folders in each month for the different folders for the individual close processes. They have sub folders for different close documents, so on and so on. Accounting needs those sub folders to manage their monthly close process, but the rest of the organization just needs to access a few documents from each close. You can probably imagine the difficulty other departments have if they need to navigate through layers and layers of subfolders to find what they need. The vast majority of the sub folders exist to support a work process, not as a method for facilitating the search for documents. When designing your information architecture in SharePoint, you can’t take your data identification at face value. You need to understand what parts of your data identification exists to support business processes. In most cases, the majority of the data organization is there to support a business process, and should be excluded when determining what information needs to be on all content to facilitate search and governance across your organization. Need help to create your information architecture in SharePoint? Peters & Associates has been assisting organizations in solving business problems since 1981. Need help to evaluate your work processes and determine what solutions can work for you? Call 630.832.0075 or email us at info@peters.com. The Peters & Associates HRPortal is a Microsoft SharePoint Online site designed to make it easy for your organization’s team members to access HR information, forms and processes. 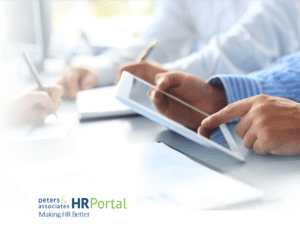 Read about the 5 Key HR Benefits from the Peters & Associates HRPortal in our free whitepaper. As Solution Architect at Peters & Associates, Chris Cummins is responsible for design in Peters & Associates development and business intelligence practices. This includes ensuring the team delivers to our standards of successful design, implementation, and satisfaction of our clients. He has over 25 years of industry experience, and has delivered over 375 Microsoft SharePoint projects for Peters & Associates. Chris has an undergraduate degree from the University of Illinois (Urbana), a MBA from Lewis University and industry technical and project management certifications. Chris’ primary role with our clients is aligning technical solutions to business needs.